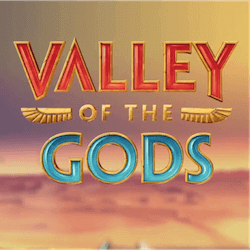 Yggdrasil Gaming, the company behind innovative and original slots action will be releasing a new member of the family entitled Valley of the Gods. As the name suggests, this is an Egyptian themed slot game. There are many examples of Egyptian themed slots out there but Yggdrasil has managed to deconstruct and reassemble this familiar theme into something wholly unique and original. When the game trailer was released it blew slot fans away. Even though Yggdrasil made sure to not reveal any game play elements, the tantalising and stunningly high quality teaser trailer had fan’s appetite whetted. Valley Of The Gods introduces many unique and rare elements to the slot genre that will have fans sitting up and paying attention. First and foremost the fantastic and iconic Yggdrasil 3D graphical style is all over this release. It is a stunning looking game that has Jonas Strandman from Yggdrasil immensely proud. He said upon the game’s release that they challenged themselves to create a design that incorporates proven crowd favourite features with new, original game mechanics that will offer an invigorating experience when combined with the lush sound and visuals. They have definitely succeeded in this task and Strandman goes on to say that this slot will take players on a great adventure. Yggdrasil has combined Valley of the Gods with their custom, in game promotional tool system called Boost. It is designed to help online casinos customise their game’s features by adding in house promotional items and features to make each game even more unique, depending on where you play it. Features can include in game missions, leader boards, raffles and more. The slot also features the custom Yggdrasil BRAG tools that allow a casino’s members to get access to instant replays of big wins and to share their success on social media. Valley of the Gods is a 5 reel slot that features 3125 ways to pay out a win. Players can wager up to 100 on each spin with a base game jackpot available of 500 coins. No Yggdrasil game would be complete without some great bonus rounds and Valley of the Gods is no exception. You can unlock win multipliers, re-spins and most notably of all the game’s Scarab feature. When this feature triggers you will see golden scarabs come out of the reel symbols. They will work to uncover stone tablets that cover the corners of the reels. The tablets that are revealed will then contain reel symbols in the next spin increasing your chances of landing a winning combination. This slot is available now from Yggdrasil supported online casinos.